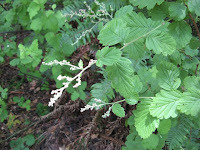 So my trip to Huckleberry Preserve looking for ripe berries was in part inspired by a book I bought a few months ago. The Flavors of Home - A Guide to Wild Edible Plants of the San Francisco Bay Area by Margit Roos-Collins, published by Heyday Books of Berkeley. 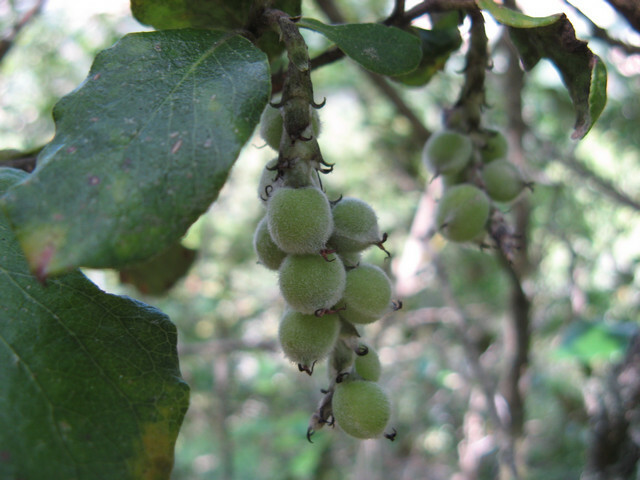 This is a great book that talks about many edible species of plants, both native and introduced, that are commonly found here in the Bay Area. It details where to find them and when and gives some information on identifying the plants. Some of the descriptions and illustrations leave something to be desired, so you'll want to find another book or person who knows to help you ID plants before chomping your way through the woods. But once you are absolutely sure you can ID the plant and know which parts are edible it makes a nice addition to your hike. 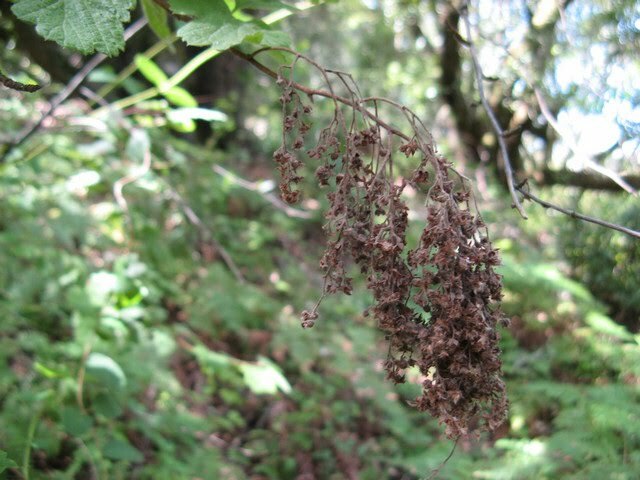 I sometimes eat things on hikes or gather them to bring them home, and people I know often ask me if I'm sure it's edible, or how I know I can eat that, distrusting the food that grows all around us. There are poisonous plants that grow here, but Roos-Collins addresses this in one of my favorite lines of the book found in the introduction: "Just remember that we are programmed through millions of years of evolution, to be naturally good at foraging. Anyone who can tell a cabbage from a head of iceberg lettuce can learn to select edible wild plants with confidence." Some of the plants she mentions I've already eaten, like miners' lettuce and nasturtium. One of the more interesting chapters was on edible seaweeds. I haven't tried any of those yet, and have been fairly cautious but I have tried some things already that I read about in the book. 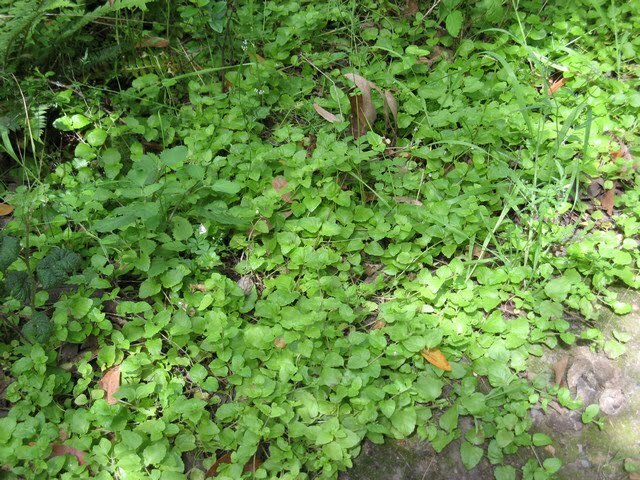 I ate some chickweed, a leafy green weed that grows in all sorts of places, including people's gardens. 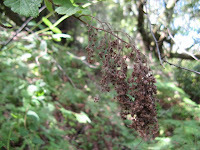 And I ate some madrone blossoms. They were very interesting. The blossoms had a papery texture, but then a very pleasant sweet aftertaste. Hopefully soon I'll be able to add to the list. So even though I didn't find any berries on my walk, as explained on my last post, there was plenty to keep my interest. 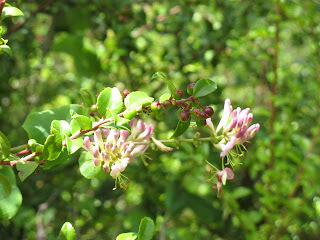 There was hairy vine honeysuckle (Lonicera hispidula var vacillans) in bloom and some huckleberries just starting to form. They are a reliable harvest, but much later in the year. 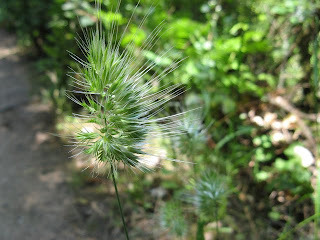 There was a very interesting grass's seedhead. Probably not native, but beautiful all the same. There was some ocean spray aka cream bush (Holodiscus discolor), whose buds supposedly taste like thyme, but most were a little too dry for my taste. Others would have worked, but I didn't try any. 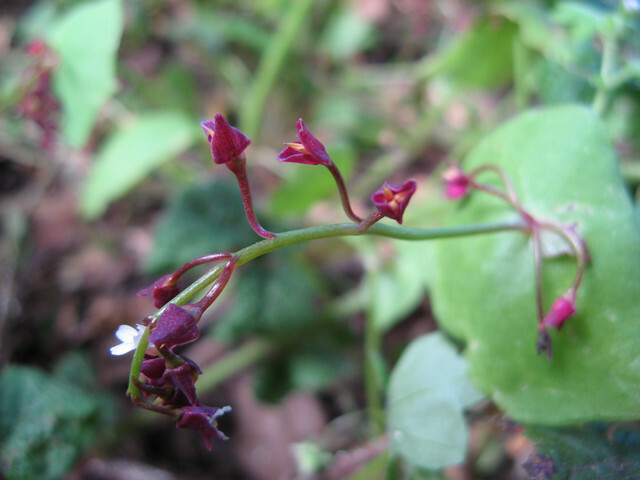 The flowers on these miner's lettuce were the most beautiful shade of purple. I'm used to seeing white blooms. Is this a variety, or do the blooms change color with age? 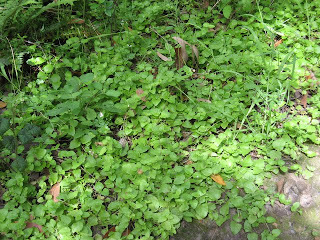 And nearby was a carpet of yerba buena (Satureja douglasii). I love the aroma of its leaves. I don't remember seeing this growing wild here before. It seems very happy. I think these might be silktassle berries. 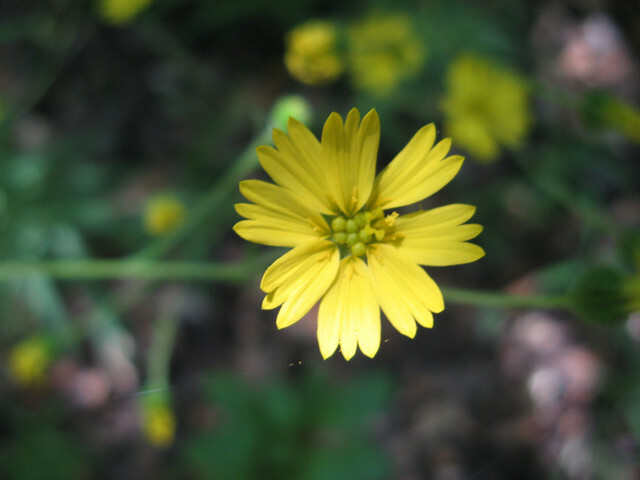 And then this little, yellow, mystery flower/weed. Anyone know for sure what either is?